WorldClock has been updated, thus we were talking about it around the office coffee machine. One of the team mentioned he would love to have it as a gift if his family happened to hear that they can ‘gift’ iPad apps. Remember the high end wall World Clocks of yesteryear, the perfect gift for the office working person that has everything? They were so cool, we all wanted them but didn’t have the relatives to buy it for us. 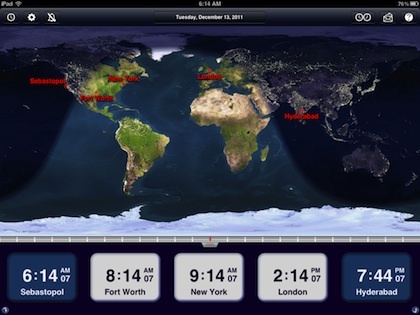 So, when WorldClock was released for the iPad, many of us grabbed it for both knowledge of time information around the world, as a fun item to have on our iPads running while it sits on our desk. The variety of clocks has been updated in the update this week. 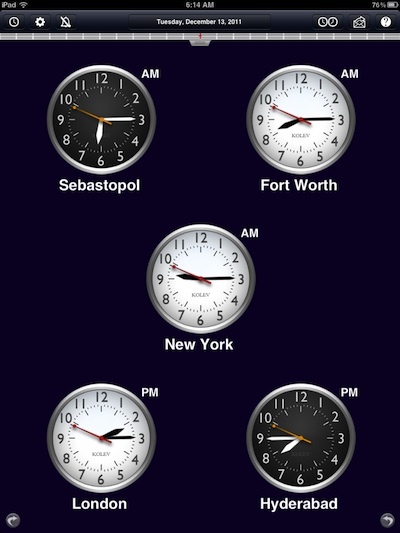 Now, along with the many round sweep hand clock faces, WordClock offers many versions of number ‘digital’ like clocks. 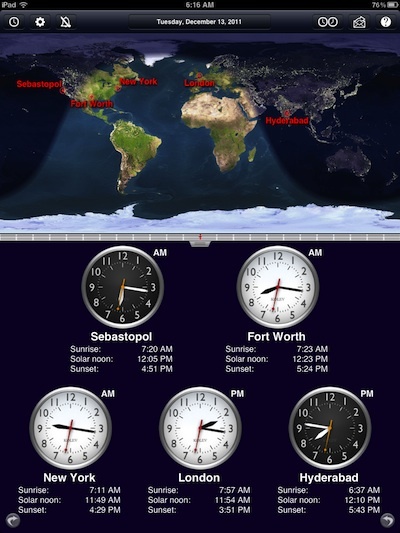 A setting allows the clock faces to show if it is day or night where the clock city is. 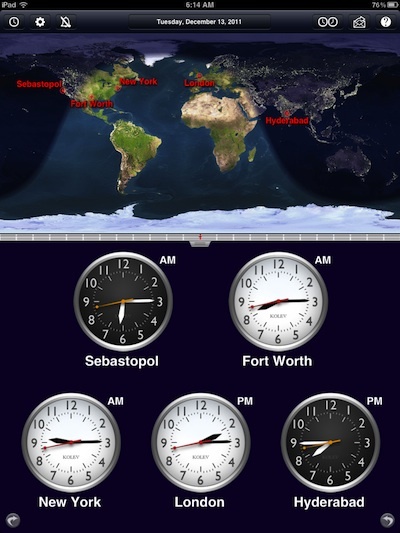 WorldClock has over 29,000 cities from all around the world. Tap and hold on a city time to see a ‘i’ which takes you to extended information on the city. 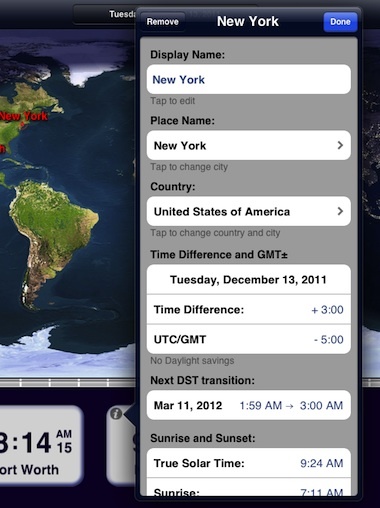 While the world view with the Sun Rise/Set graphic is what draws us to the WorldClock app, it is possible to just show the clocks. In both the landscape and portrait views, just sweep your finger up and hide the world map, sweep down to show again. 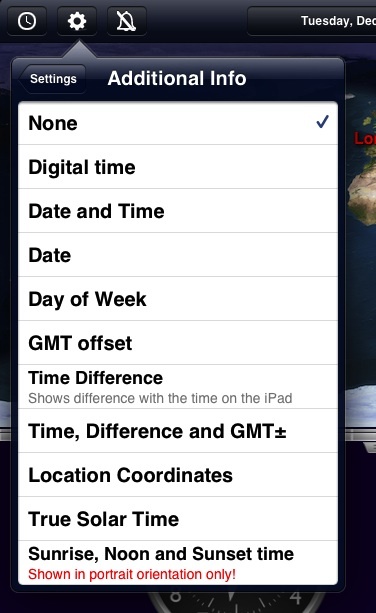 If you want more information than the basic clock faces, WorldClock offers a long list of ‘Additional Info’. Depending on which items you choose to show as ‘additional information’, some will only work in Portrait view since it allows more room around the clocks.